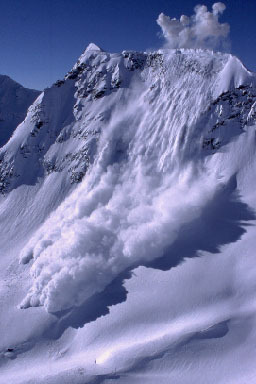 Cornice control avalanche, Cariboo Mts. B.C. How have organisms adapted to survive in snow-covered environments and how have the various physical aspects of this environment exerted selection pressures on its inhabitants? What sort of niches exist under the surface of the snow pack? This program will be equal parts outdoor leadership skills and ecology. Students will gain the skills to survive and thrive in the alpine winter environment and we will then use these skills to explore the ecology of snow-covered areas. 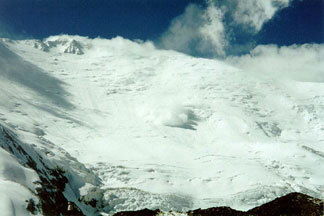 We will begin by studying snow physics and assessing avalanche hazards through GIS modeling and field studies. All students will complete the outdoor industry standard advanced medical training (Wilderness First Responder, an 80-hour training) and will receive a nationally recognized certification. Students will also learn winter travel and camping skills and then combine all of these skills with ecological investigations of snow-covered ecosystems in the Pacific Northwest. There will be a significant field component to this class, regardless of weather. Students must provide their own winter camping and safety gear (sleeping bag, clothing, avalanche shovel and probe). Due to the demanding nature of this program, students should be physically fit and able to hike with a pack across snow at elevation of 6,000 ft. and above. Faculty Signature required. Faculty will assess student�s writing skill, background knowledge, degree of interest and enthusiasm, and physical fitness. Parts of this program will be taught in intensive modules that will include weekend days and will include all day, every day in at least the first three weeks of the quarter. Interested students should download the application, fill it out, and mail to (if you are out of the country, you can email it, but I prefer hard copies): Paul Przybylowicz, Lab II, Rm 3271, The Evergreen State College, Olympia, WA 98505, email me by Friday March 1, 2002. Students will be notified via the program web site and at the Academic Fair on March 6, 2002. Program is preparatory for careers and future studies in environmental education, experiential education, field ecology, and backcountry medicine.